This magnificent luxury villa is simply a slice of paradise. Located on Koh Samui's stunning west coast it offers exceptional accommodation and unrivalled allure in an exquisite beachfront location. With sleeping space for up to 14 guests there's plenty of room for families and large groups at this tropical retreat which exudes traditional charm and contemporary appeal with a stylish layout, spacious dimensions and splendid sunset views. Flanked by a secure stone wall and imposing wooden gates this private home offers the ultimate in luxury island living. Nestled in an exclusive development on Lipa Noi beach the home boasts everything you need for the perfect tropical getaway including six sumptuous bedrooms, seven bathrooms, a luxury open-plan living area and a spectacular sun deck and infinity-edge swimming pool. Guests are greeted by an impressive entrance with a covered pathway that winds past stone pillars, tropical plants and a large lily pond to the villa's front door. To the right of this exotic and enticing path are the staff quarters and a double garage and to the left is an immaculately landscaped garden featuring a bespoke children's play area plus a single storey pavilion housing two of the villa's six bedrooms. The first bedroom features an en-suite bathroom, twin beds, a wooden vaulted ceiling and large wall-mounted flat-screen TV. The bathroom boasts twin basins, an indoor rain shower, a custom-designed dressing area and a private outdoor shower. The room enjoys views over the front gardens, walkway and lily pond. The second bedroom located to the rear of the pavilion includes a grand teak four-poster bed, sumptuous furnishings, a dressing area and en-suite bathroom with twin basins and indoor and outdoor showers. Doors open onto the rear garden area with views across the sun deck, swimming pool, beach and ocean beyond. Past the lily pond lays the main two-storey living pavilion housing a lavish open-plan living room and two further bedrooms. To the right of the living area is a modern fully-equipped kitchen with contemporary white units, central island feature and dramatic dark slate-tiled floor. The impressive living room features hardwood flooring, a plush lounge area and a lavish dining space with seating for up to 12 guests. Sliding glass doors to the front and rear create a light and airy living space with uninterrupted views across an impressive shaded patio, the luxuriant sun deck and oceanfront. To the far end of the living room is a fully-stocked wine cellar with space for up to 400 bottles plus a vast cinema screen and staircase leading to the first floor where there are two further bedrooms with a shared balcony and sun terrace and a further set of stairs leading down to the garden and pool area. The upstairs bedrooms both feature dressing areas and open-plan layouts with glass-walled en-suite bathrooms that allow for impressive views whilst enjoying the sumptuous terrazzo bath tubs. Both rooms also feature luxury furnishings, rain showers, built-in wardrobes and flat-screen TVs. Permanent sunken sunbeds, swim-up bar and an impressive sand-stone pool deck there is simply no better way to wile away the day. A poolside sala is located directly on the beach with a double-sided bar, comfortable sofas, alfresco dining area, BBQ and music system. 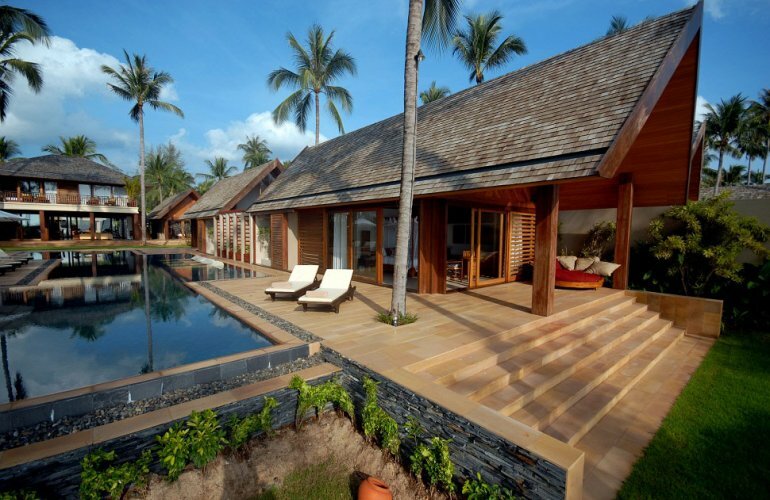 At night the villas stunning grounds are lit for the perfect atmosphere to relax or entertain. To the left of the sun terrace area are two poolside bedroom pavilions offering sumptuous four-poster beds, en-suite bathrooms, twin basins, indoor showers and poolside terrazzo bathtubs. The first bedroom suite includes an inner garden and soothing waterfall feature plus an adjacent dressing room with comfortable sofa bed for smaller guests or children. The second suite located on the beachfront opens onto a charming furnished sun patio and enjoys spectacular ocean views.